This bike was first built in late 1974 in Paris, IL by Gerald Hayes with an XL250 motor. It was built about the same time Cycle World ran a pair of articles (Nov & Dec '74) on how to build a C&J XL just like this. That was right after American Honda's race shop had built one to race at Evel's Snake River MX. Gerald raced at Lincoln Trail Motosports at that time but had little luck and then used it as a playbike. It spent many years in the attic of his father's garage in pieces. 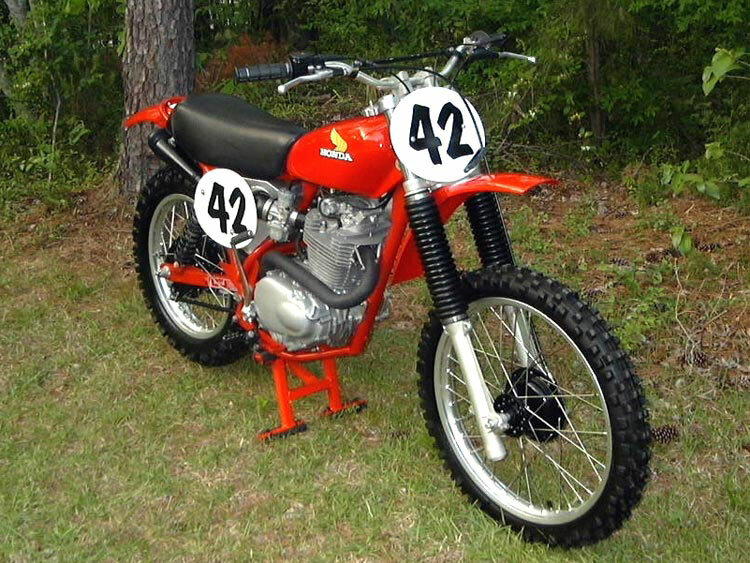 Former MX buddies of mine knew I was looking for an interesting bike to race AHRMA events with. I quickly bought the bike and Stan Trulock of Glenwood Springs, CO who had formerly raced with all of us and also had a C&J XL put it back together. We pumped the XL 350 to a 449cc stroker (Bill Bell style motor). C&J told us that this bike was one of the few that had their aluminum still air box which is a very nice piece in and off itself. I raced my first vintage MX at Steamboat Springs and trophied. I was hooked again. I went on to win four national AHRMA titles on this bike racing it all over the country. Brian Slark, head restorer for the Barber Museum, formerly owned a C&J XL and agreed to freshen the bike up. You can see the result. The bike now sits in the AMA's Hall of Fame Museum in the Hall of Fame area. Send everyone down to see the Motocross America exhibit there at the museum. I have pictures of it racing here and there, but the quality is not as good. You can go to My Website to see more pictures plus the picture of my brand new (then) 1973 Elsinore, one of the first 300 made. That Elsinore was the first bike I actually motocrossed with. I always thought they were the best looking of bikes. If you look at that site you can see my "Keep on Racin" logo with the #42 bike pictured in a retro (Keep on Truck'n) graphic.